Perhaps the biggest challenges in launching an inbound marketing campaign as part of your Web Marketing Strategy, is coming to grips with the sheer volume of content you’ve committed your company to. It isn’t an insurmountable task. It just seems that way. How do you eat an elephant? One bite at a time. The key to ensuring success in achieving the lofty goals you’ve set…. breaking down the process into easily digestible tasks. Ideally, you’d focus on only those tasks to which you provide the greatest value within short bursts of focused time. Everything else? Delegate. We addressed this topic in a recent post: How To Create Great Blog Content in 9 Simple Steps. Another key is getting visibility on the work at hand so you can manage the content creation process effectively. This will allow you to delegate, monitor the quality and sleep well at night knowing with confidence your blog content will go out on schedule…and be something you’re PROUD of. The Editorial Calendar (or Content Calendar) has been employed by publishing houses and news agencies for years. Think about it. The Wall Street Journal isn’t starting from scratch every day hoping they can fill 50+ pages of content. Yes, they are a daily news organization feeding the latest business news to you within hours of it happening. BUT how many of their content have been in development for weeks or even months in advance? I wouldn’t be surprised if Walt Mossberg and All Thing Digital have their editorial calendars blocked out for the next 3-6 months. Guaranteed, they’ve got something on the books for the next generation of iPad and are gathering relevant information they’ll need when it comes time to sit down write the article. It’s how every publisher ensures quality… by giving themselves just enough lead time to do the hard thinking, research, editing, and refinement to deliver timely and engaging content. 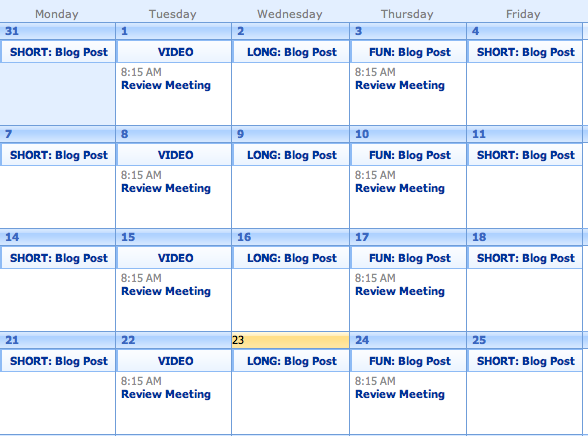 How Can You Employ a Editorial Calendar for Your Blog Content? 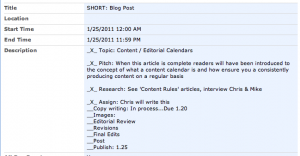 As in the example above, publications have regular, predefined columns and / or ‘beats’ with assigned writers producing content on a set schedule. Where the Wall Street Journal will have Personal Finance, Management, Media & Marketing, Retirement Planning, & Energy to name a but a few, you might have anywhere between 3-10 key topics you want your blog to focus on for maximum SEO return on investment. In Content Rules: How to Create Killer Blogs, Podcasts, Videos, Ebooks, Webinars (and More) That Engage Customers and Ignite Your Business (New Rules Social Media Series) Ann Handley and C.C. 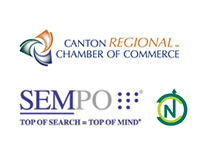 Chapman touch on one method one site uses by identifying each of the types of content they will produce on a cycle of 1-7-30-4-2-1 (daily-weekly-monthly-quarterly-semiannually-yearly). One 400-word article on industry findings, events & research. Once you’ve got the basic calendar structure set, you start to get a real (physical) sense of the amount of work required to meet this schedule. Which may seem daunting so you might re-neogtiate that commitment. But in reality now that you have visibility on that work, you’ll feel more in control and can use the calendar to begin delegating pieces to co-workers or running your internal processes to start creating pitches for each of the coming articles in the next 3-4 weeks. We recommend using a shared calendar like MS-Exchange, Google Calendars, etc. to distribute the production schedule out to your co-authors. We use our calendar as place to hold an abrieviated version of our content checklist so we can monitor how far along we are on each piece. So for any given piece you can see which parts of the piece need still fleshed out. In the example to the right we show the in-progress updates we used to keep this put together. Will we nick off every item on the checklist here? Maybe not, but by breaking it down each task itself didn’t seem so scary. We can then go through the coming week’s events and decide which tasks we’re going to pick up next and where best to focus our limited time and resources.